Thought #1: If it is really important you will make time. If it is not you won’t. As a parent I started to use the phrase “There are lots of reasons, but there are no excuses.” in response to teenagers in my life coming up with various excuses why things don’t get done. It helped me shift them from passing the blame with an excuse back to thinking about the reason something happened so we could have an Adult to Adult conversation around the importance of what was supposed to get done and what we could do to make that barrier (aka. reason) go away. It also helped remind me that these reasons are real for them and I cannot unilaterally fix them, but together we can probably figure it out if they will own the reasons and agree on the priorities. There are lots of reasons for not sitting down for 30-45 minutes once a quarter with your people to focus on their growth, but no excuses – – if you really do care about their professional development. I recently talked to a leader struggling with the One-on-One template/meeting structure I share on my website. It was lots of work for him, and his people were not really engaged. As we talked, I learned he was filling out the form and owning the updating of it and the scheduling of the meeting. It was lots of work because he was doing their work. We are working on flipping the model. Remember to encourage and support them. If they are not sure what their role is give them my whitepaper – 5 Tips for Owning Your Career and Development. In my book, I talk about how OBN (Ought But Not) Leaders have fallen for the illusion of control around time. Leaders need to make sure their TIME is focused on THEIR PRIORITIES and the ORGANIZATION’S PRIORITIES. It is not easy, but if you really believe investing in your people is a priority, then we can find the time. The tools are easy – read the HBR article Who’s Got the Monkey or read my trUTips on this and go to the special web page for additional resources to help you start owning your time. The work of change is not easy, but it is important and achievable. The ironic think is that I made the statement that started this post. I believe Learning + Doing = Growth, so I am busy making my development a priority and finding time to make it happen. I have no excuses. Do they/you know what is expected of you at work? What are they? I don’t look at creating a performance focused culture, because my experience has shown me that leaders take this path by starting with accountability and expecting work to get done. I have learned through Denison, a partner company I use for surveys, and my own experience that it is important to focus on creating a culture that supports performance. It aligns with my own belief that individuals own their performance and development, and the organization owns support. When we start with defining the target together and supporting the work to get there (frequent one on ones, asking what they need, following through, repeating often), more often than not it ends in a trusting relationship where the important things can get talked about. Leaders, this is your work in SUPPORTING performance through the culture you create. When people ask you what they can do to help, tell them. Beware of asking for the extremes – no help (because you are frustrated, angry at someone, or your EGO is on overdrive) or having them do everything. Sales is a great example because of the frequent ups and downs in a challenging market. When you are missing sales numbers – role playing, prioritizing your leads, reviewing your pipeline are all great support activities. Maybe even asking some people to make some calls for you or leverage relationships they have in some of your maybe companies. Support is a two way street, it has to be offered and it has to be accepted. The times we get in life when it has to be forced are the tough times. Just ask an adult child who has arranged assisted living or nursing home care for a parent. If the point is reached where a leader feels they need to force assistance in getting work done (what individuals often call micro-managing) it is probably time for you to leave. I know it is never that easy, but it is that simple. If that outcome is not what you want, then start back at the beginning and make a commitment to change your half of the conversation. As leaders, we are measured largely by outcomes. Did the work get done? Was the margin there? Yet there is a process that helps us achieve those outcomes that does call into question what we believe is most important? In my work with growing companies I have learned to ask the question “What is your funding source – debt/cash flow, private equity, or venture capital?” I can usually feel the difference, but ask just to make sure. When speed and growth/returns are so critical (latter two), then generally outcome trumps process. Your talent strategy should reflect your belief in what is most important in your business. This is also not about a good and bad labeling exercise. Those words tend to stop a conversation and start an argument. I use effective and not-effective, because it forces us to remember the outcomes we wanted in the beginning. If our goal is 30% EBITDA growth and a few leaders get burned out and leave, maybe that is okay. Fast growing companies need to be great at bringing in leaders/personalities that will figure it out and be successful. That needs to be there #1 focus. I love having this conversation with leaders, because is revealing and it matters. It also helps people define their own path to increasing their own capacity to lead. That is a process I can get excited about. **If you want to dive into this topic a little deeper, chapter 2 in my book outlines what I call the OBN (Ought But Not) Leader. On Amazon. Great conversations start with a question. As a regular reader, you probably are tiring of hearing this statement from me. A friend reminded me yesterday of a lesson she was re-learning with her kids. They were testing her with statements meant to shock her, and while her impulse was to react, her intuition told her to take a deep breath and simply say “Tell me a little bit more about that?” Then keep breathing and listen. The goal is never to mask what you are thinking and be seen as a Teflon person who is never rattled. The real goal (and my intent when I do it as a facilitator) is to delay reaction until more is learned. 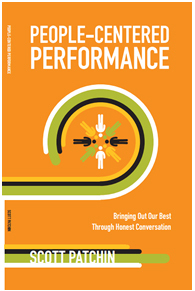 Performance conversations: What are 3 things you want to accomplish with this review? One-on-ones: What is energizing you right now? What is frustrating you right now? What do you want to make sure we cover today? It is important for you, as a leader, to remain calm and focus on understanding before reacting. Certainly, there is a case to be made that the words Fire or a gunshot going off demands a quick response. Yet those who are professionals in responding to such events are trained to assess even as they react. Leaders need to learn that – and it begins with having the discipline to ask a couple of questions to lead them past the emotion to the core reasons they are making that statement. Behind a reason is a need, and leading with their needs in mind is what leaders do when they actually care. Put another way, to care is to listen. Great conversations start with a question. Questions put us, as leaders, in the position of listening. Listening is good, and remember to breathe. The conversation around performance is always a tricky one. When I walk into a new working relationship with a CEO/Leader, I often hear the word accountability as a desired outcome. When I explore it I hear stories that illustrate a leadership style that starts with ‘hands off/you own it” and generally ends up with “Letting them know my frustration / taking on the task myself”. When this is the story, I can guarantee a leader that those they lead are not owning the results because the leader is not giving them the appropriate space and support to do the right thing. Here is one shift a leader can make to start down the path of being a better supporter/coach and ultimately increasing the accountability they see with their team. No Excuses . . . . The definition of an excuse when it is used as a verb – attempt to lessen the blame attaching to (a fault or offense); seek to defend or justify. If you are managing an english major or someone with Google skills, they might point out that as a noun the definition is a reason or explanation put forward to defend or justify a fault or offense. In either case, excuses are put forth because a person feels the need to defend their action. Excuses start us down the path of establishing guilt, penalty, or innocence vs blame. It could track back to the culture established by the previous leader – which is an excuse in itself! Lots of Reasons . . . The response started with the words “Well, she did not do what I asked her and . . . . . “. It was the language of an excuse. The thing that stuck in my mind was I will accept reasons, but please don’t give me excuses. As I watch leaders and teams work through things, I have seen how excuses create lines for battle. He said . . . . She said . . . . They said . . . . It gets messy really fast. When emotions are raised by assigning blame first, it is hard for most people to step back and talk through it. Excuses generally point outward at the environment or actions of others, and lead to blame and away from solutions. When we focus on getting some reasons out on the table, it requires us to ask a few more questions to establish what assumptions or knowledge are being brought into the conversation. Establishing this allows ownership to emerge. The focus can then be on a decision they made that got in the way of something getting done or getting fixed, and what the action plan looks like. When something happens or your outcomes are questioned, do you give an excuse or ask a few questions and focus on reasons something happened or did not happen? How does it effect the conversation? As you interact with your team, what do you hear more of – excuses or reasons? What is the impact of sharing excuses vs reasons? I am watching my favorite episode ever of Dog with a Blog and thought I would finish it before I fed our hungry dog. That was probably not a good decision, because the next episode was my second favorite ever, so let me shut off the TV and take care of it. I could be waiting a while, but I know the expectations I need to share and the questions I need to ask in the future. In a career transition program I facilitate in Michigan, our second day starts and ends with the question How do you feel?. It is a critical and strategic because it challenges people to put one word around where they are at that moment, and as facilitators we can use that word to know where we need to spend more time to circle back for some one on one conversations. It is not about fixing someone’s answer, but more about giving a voice to knowing when there is a potential barrier to learning/doing the work. This is one of those keeping the pulse strategies, that allows a group to move forward to important work, lets individuals share where they are at that moment, and in a very direct way ask for help or pause for a celebration. So what can we do as leaders to create those moments? First, Do you believe it is important to give your people space to air some of this stuff? If yes, read on. If no, I encourage you to read one of two books: First Break All the Rules by Marcus Buckingham/Curt Coffman or Drive by Daniel Pink. I share these not to make you a psychologist. My advice to leaders is their best focus is NOT to try and get inside the heads of their people, but try and get what is inside the heads of their people on the table so it can be talked about. I probably opened a can of worms with that comment – consider the comment section of this blog as a space to explore that if you desire. I am happy to defend/discuss it there. Back to the question – How can a leader get feedback on what is on the minds of their team? 1. Meeting space (weekly/monthly) – The question: Create an agenda item at the beginning: Around the room: 3 Wins this week/month and 1 frustration. The execution: Just listen. Be ready to plug a big frustration aired by the team into a brainstorming/problem solving space later in the meeting or ask the person to connect later in the day with you to spend some time. If you are uncomfortable with asking/handling this question/space – get some training/mentoring soon. Not being able to ask this question and process the answers effectively will be an issue. 2. Create regular space/time to connect directly with employees – The question: What is one question you have or you are hearing that needs an answer? (note the strategy – people can ask their question (higher risk) or just share one from someone else. The execution: Make this a monthly habit with coffee and donuts. This space should be all non-direct reports and select based on anniversary dates for that month / birthdays / just became a leader in the last year / new employee that month/quarter. The key is make it inclusive and give you a chance to listen. Small company? Pizza once a month and find a round table – and whoever is there gets the question. Mini trU Tip: Why I think some coaching training for leaders is critical? When you invite people share things stuff will come out that requires you as a leader to: 1) Ask more questions to help the individual reveal what is at the core of this issue 2) Help the individual identify one thing they can do to address it or explore it more so it can be solved at some point in the future. If you want to spend some time learning about the voice of a coach I direct you to a blog I love by Mary Jo Asmus or a book I like called Co-Active Coaching. My only caveat is that spending time in both of these resources will help you experience the voice of a coach, and especially the Co-Active Coaching book will help you understand the process of coaching. In the end, if you want to become proficient at it plan on starting with a year-long commitment to learn about it and practice it.